Wave59 makes placing your orders and managing your positions hassle-free with intuitive, integrated chart-based order entry. Orders and position information are color coded in the chart while stops and limits are adjusted by simple clicks & drags. The Wave59 Integrated Order Management displays your open orders from all markets for quick reference, making reviewing your strategies easy. In addition, QScript™ functions are provided that interface with the order entry module, allowing you to build 100% automated trading systems. 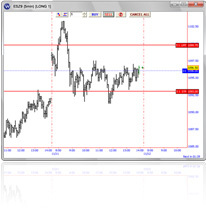 Let Wave59 analyze the market and place trades for you according to your predefined rules!